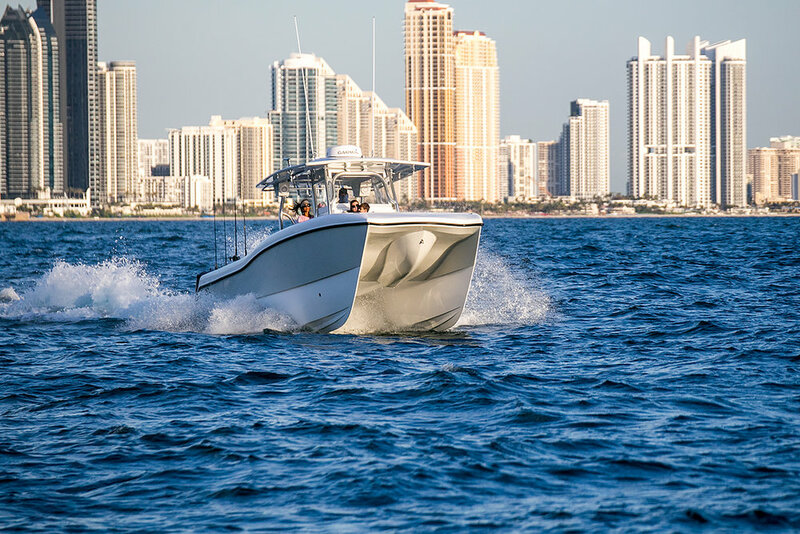 A direct descendent of the Prowler 306 that shattered the standing New York-to-Bermuda record back in 2002, today's Prowler 31 preserves that hull's exceptional ride quality and efficiency while offering an even more spacious and versatile layout. 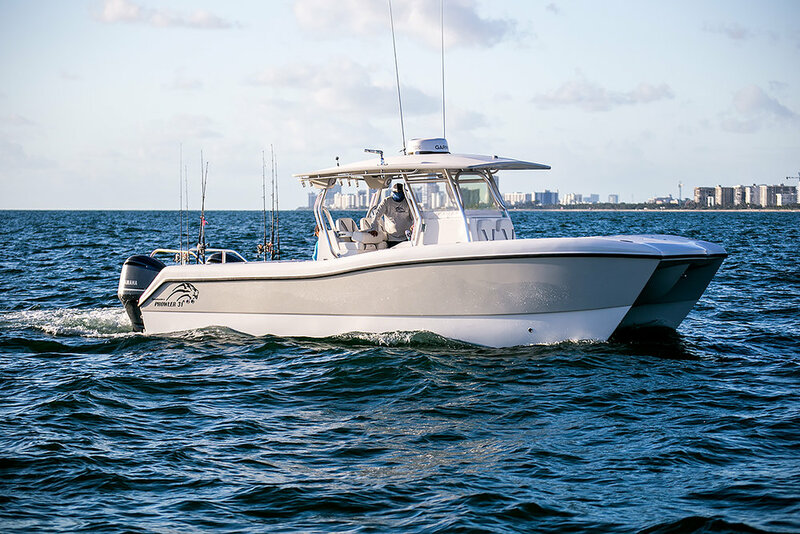 With a huge 10'10" beam, an LOA of 33'0", and three-piece construction, the 31 easily accommodates large crews, multi-day loads, and tanks and equipment for half a dozen divers. 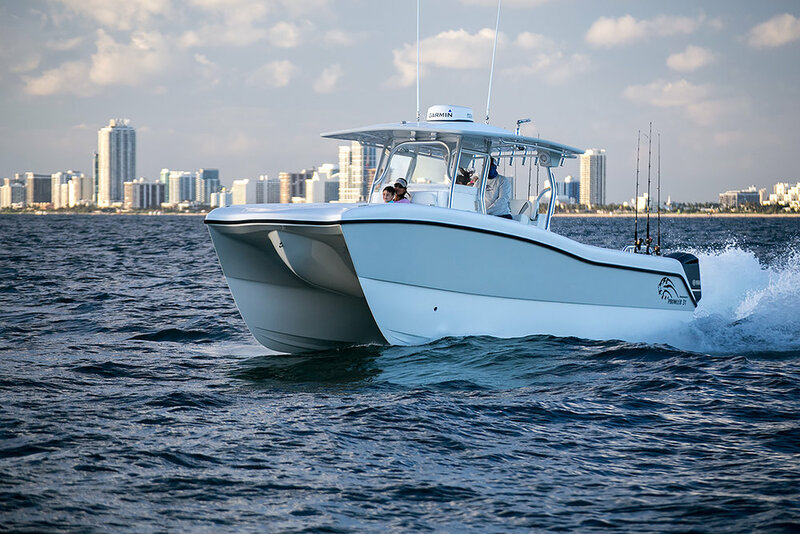 The cockpit covers some 60 square feet, the console interior is big enough for a queen-size mattress on the floor, and total belowdecks storage exceeds 1,750 quarts — all of it in lockable, insulated, and illuminated compartments with racks for eight offshore rods. 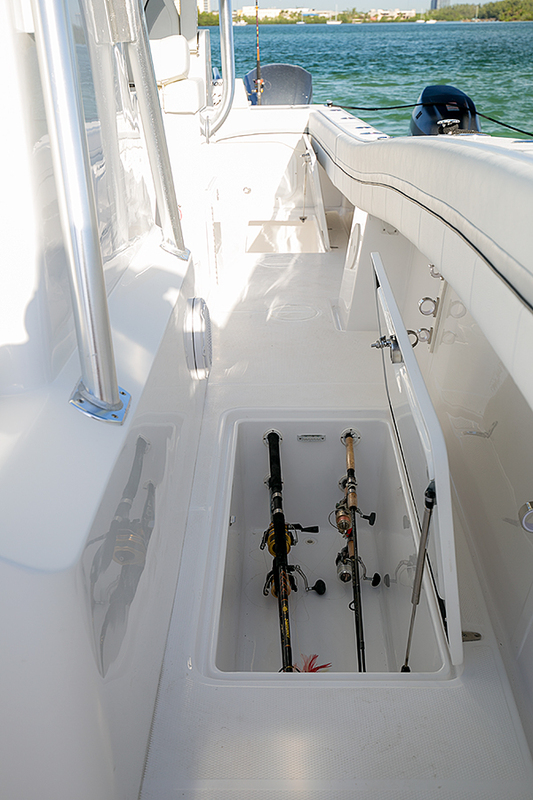 Fishing and diving features include two lighted transom livewells, dash space for a pair of 16" displays, two customizable leaning-post tackle cabinets, an oversized anchor locker for deep reefs and ledges, a forward fishbox more than seven feet long to accommodate the biggest wahoo, and a walk-through transom with integrated dive platform and ladder. 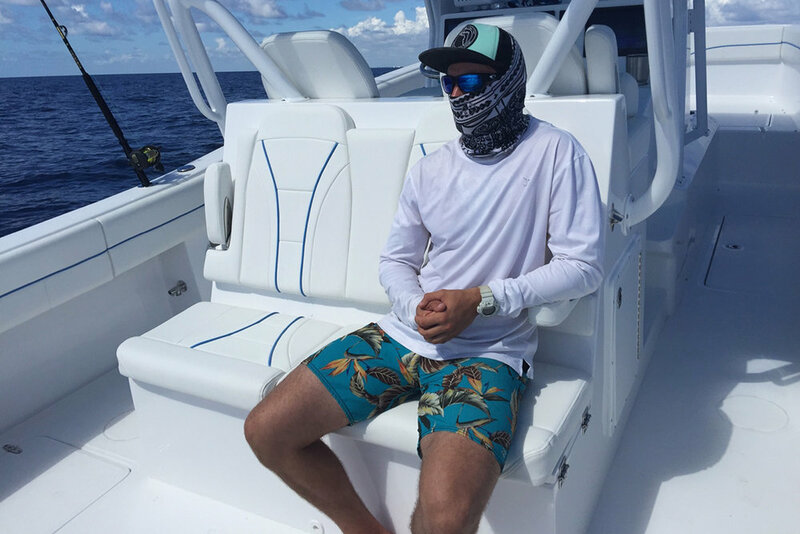 Weighing in at around 3,800 lbs. 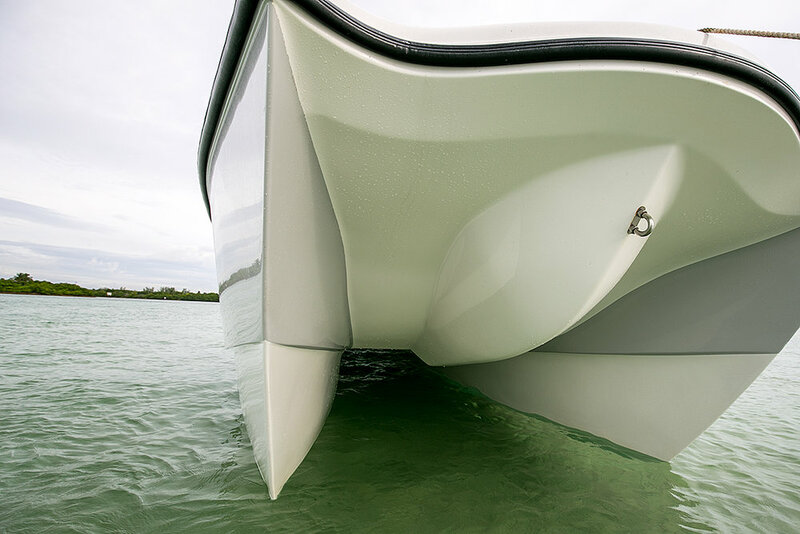 dry, the 31 draws only about a foot of water with engines up, allowing her to go places competitive monohulls can't even think about. 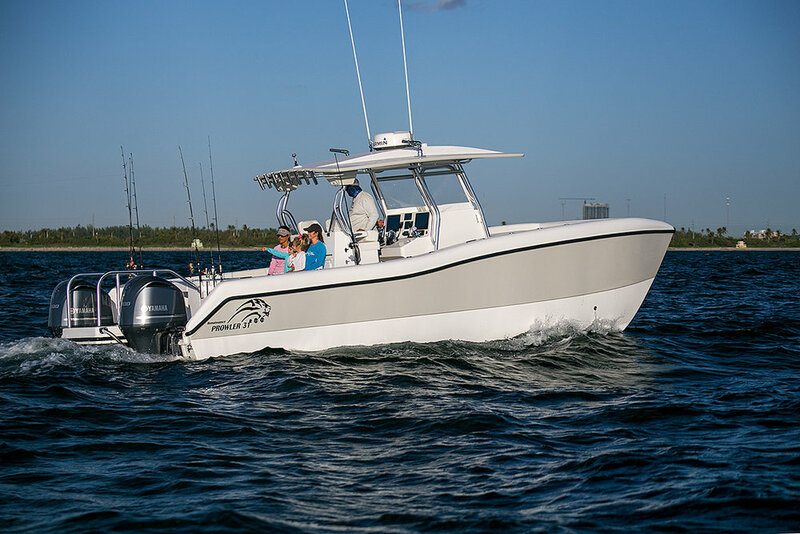 With twin 300s, she'll cruise in the high 30s to low 40s while burning 1.5 to 1.9 mpg and will approach 60 on the pins. 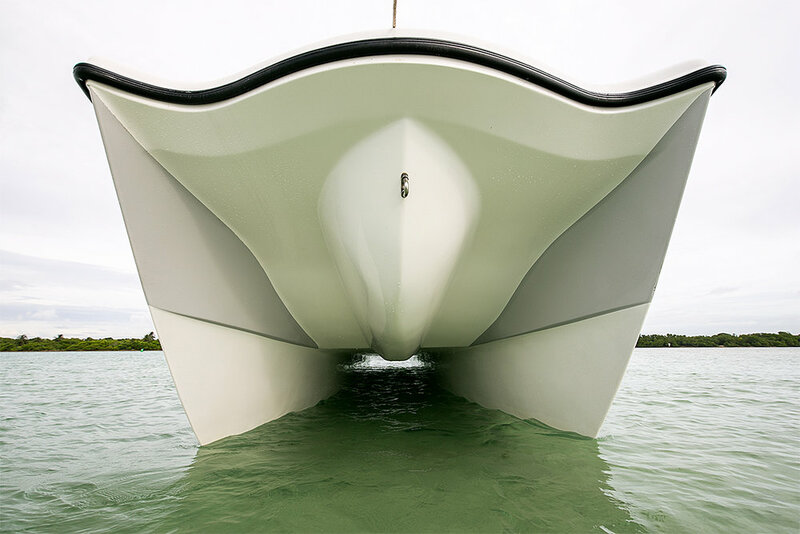 Hull weight dry: ~ 3,800 lbs. 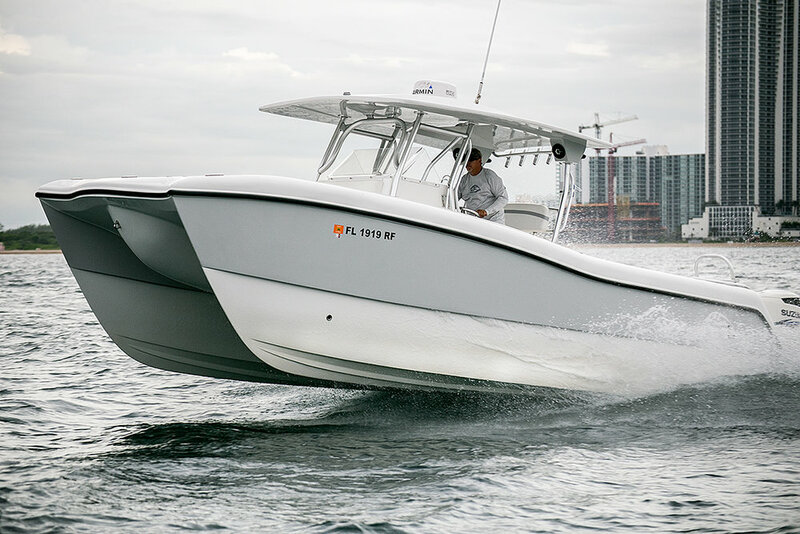 Unlike other cats in her class, the Prowler has two livewells — one in each cockpit corner, right where they're needed. 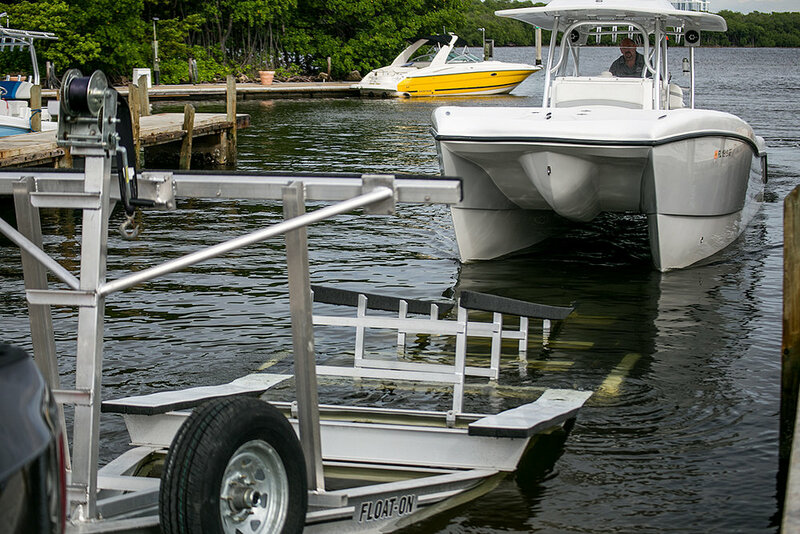 Between them a transom gate accesses a large platform with folding ladder, perfect for everything from scuba diving, to working fish around the engines, to clearing line from the props, to loading gear while on the trailer, to sliding swordfish aboard. 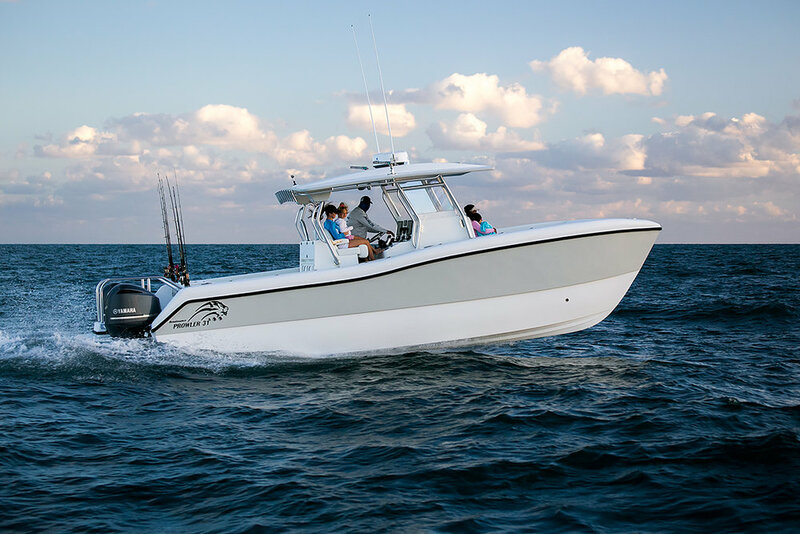 The Prowler 31 comes standard with plenty of custom touches — LED lighting in all compartments, for example, and your choice of color-coordinated upholstery — but owners have an unmatched level of input on other design decisions too: Spec your own T-top, hard top or tower. 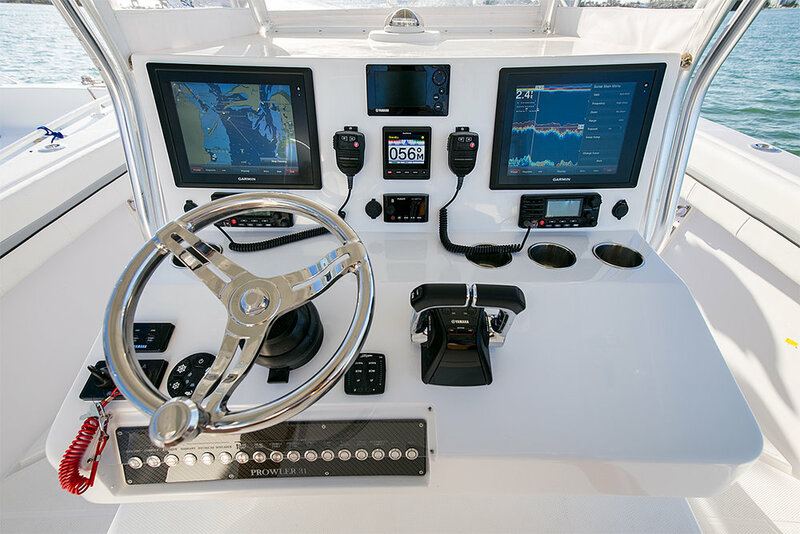 Configure your audio system. 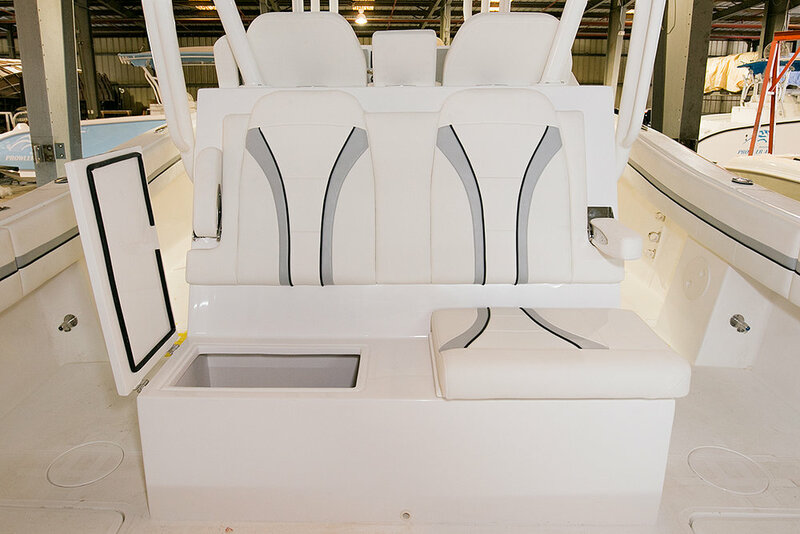 Add rear-facing seating. 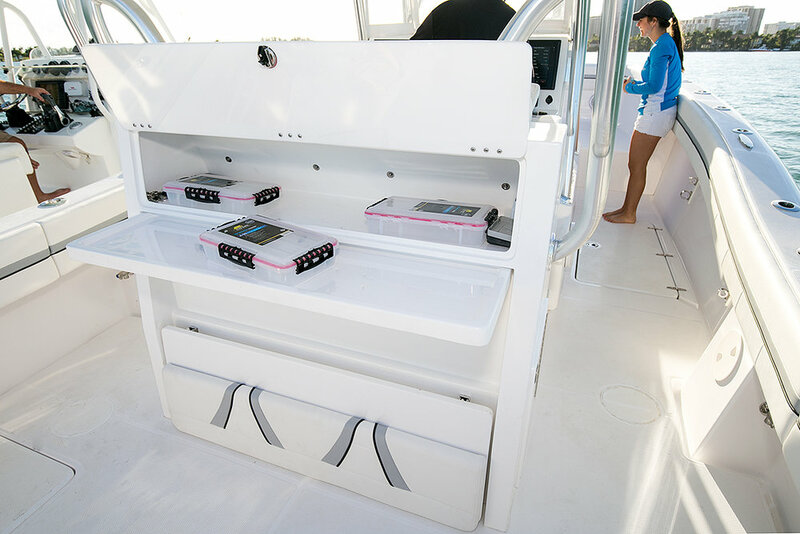 Design your own dive tank storage system. 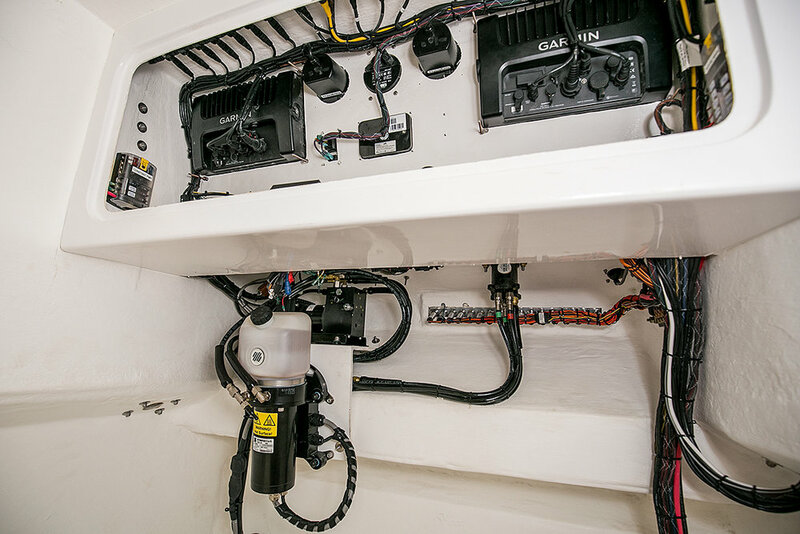 Have your live wells pressurized. 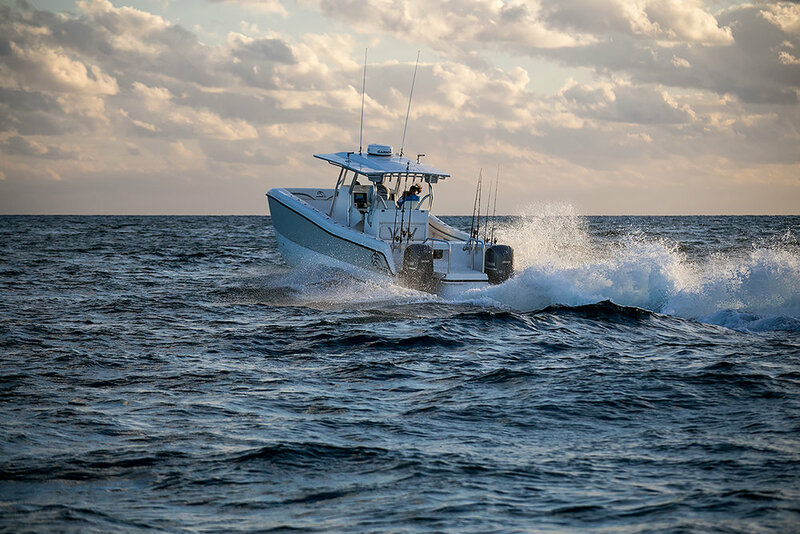 You're a full partner in the process. 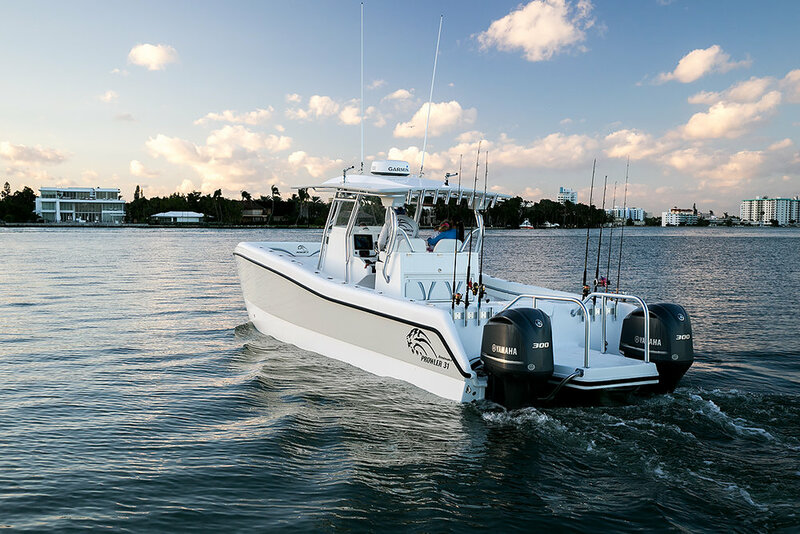 Prowlers may be purpose-built fishing and diving boats, but they're also designed with versatility and crew comfort in mind. 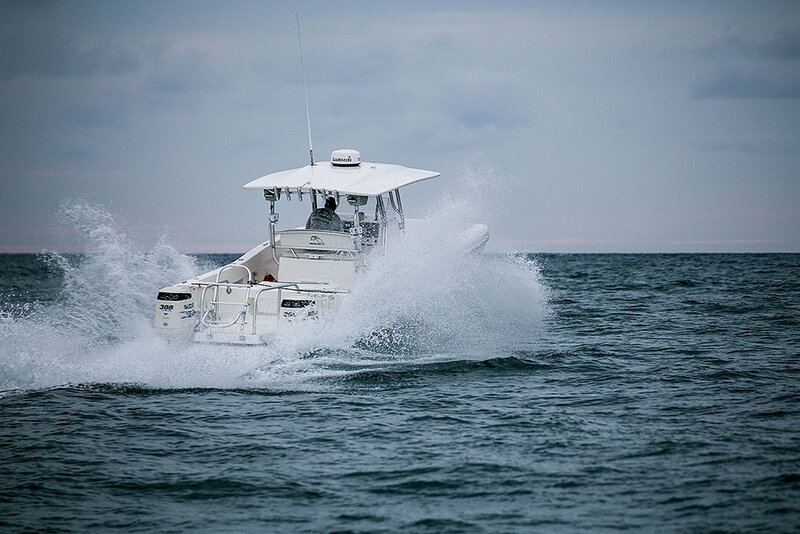 On the 31, that means a massive, unobstructed forward casting deck that can pull double-duty as a lounger for the sandbar or a bunk on overnight tuna trips; an available 12' x 8'6" hardtop for real shade; a standard 20-gallon pressurized freshwater system; and a console with plenty of room for a full-sized head. 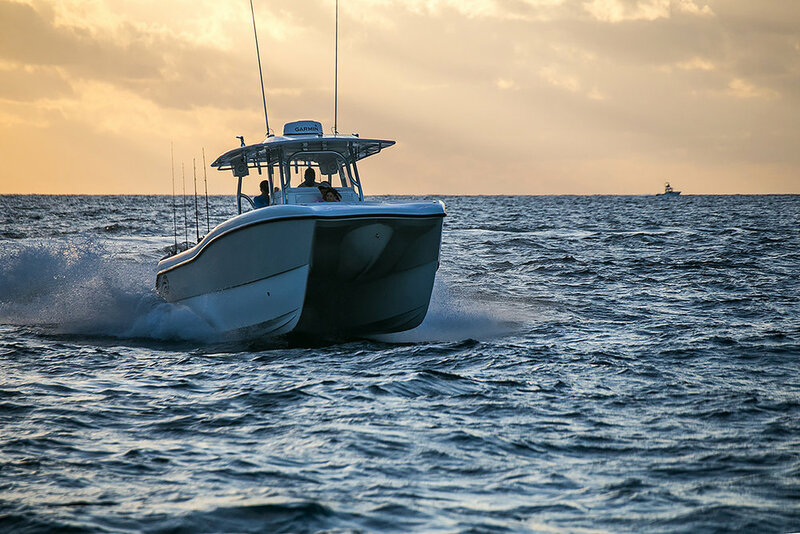 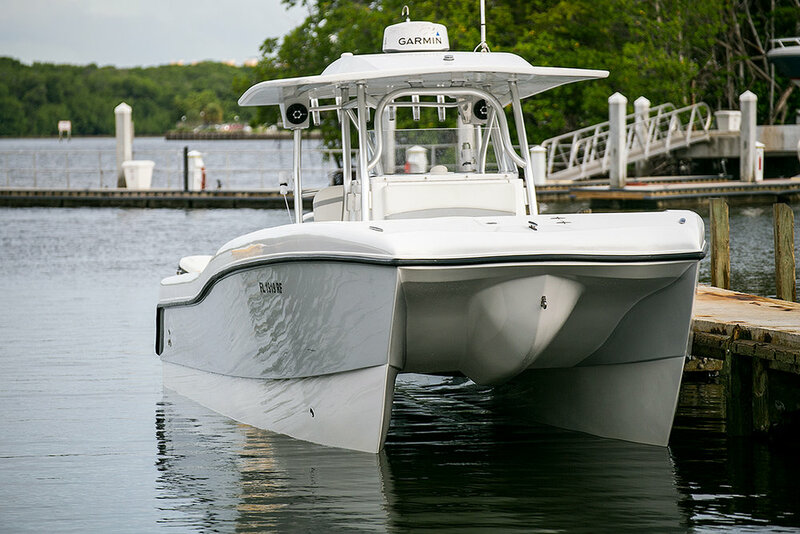 As a result of state-of-the-art lightweight construction and patented running surfaces incorporating keel pads and unique lifting strakes, the 31 delivers higher speeds and more miles per gallon than competitive cats with equivalent power. 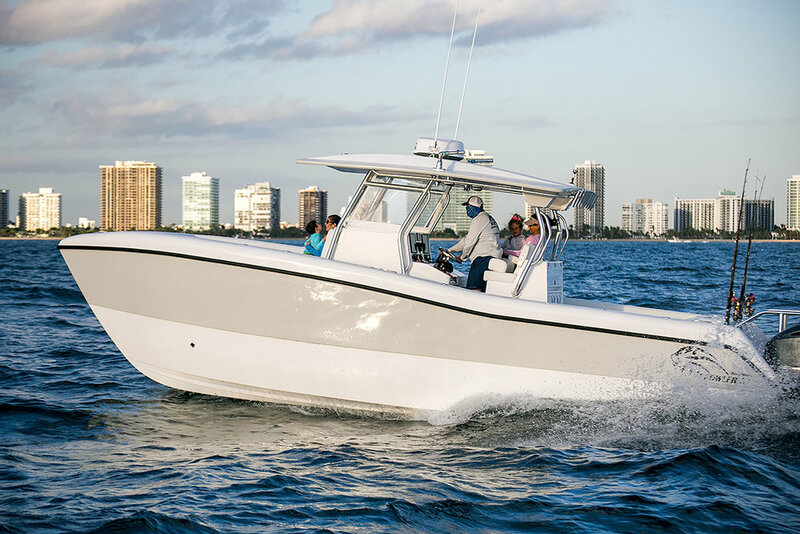 With twin 300s, she tops out well into the 50s, and some owners report cruising efficiency of up to 1.8 mpg at 40 mph. 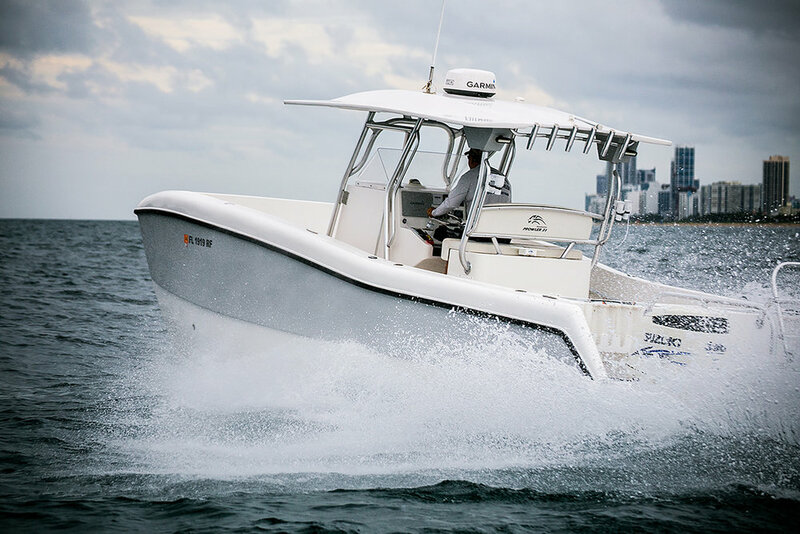 Prowler 31s and 306s are in use all over the Western Hemisphere as dive boats, research vessels, yacht tenders, and cocktail cruisers. 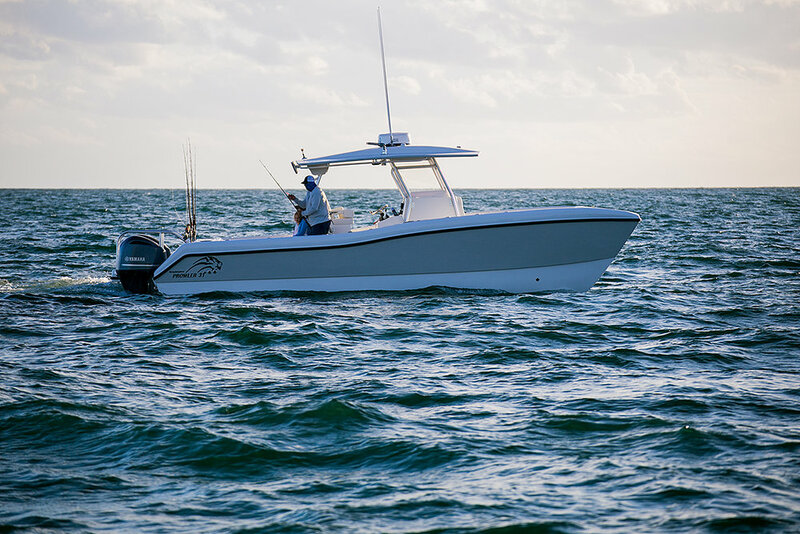 But at heart, every Prowler is an offshore fishing machine. 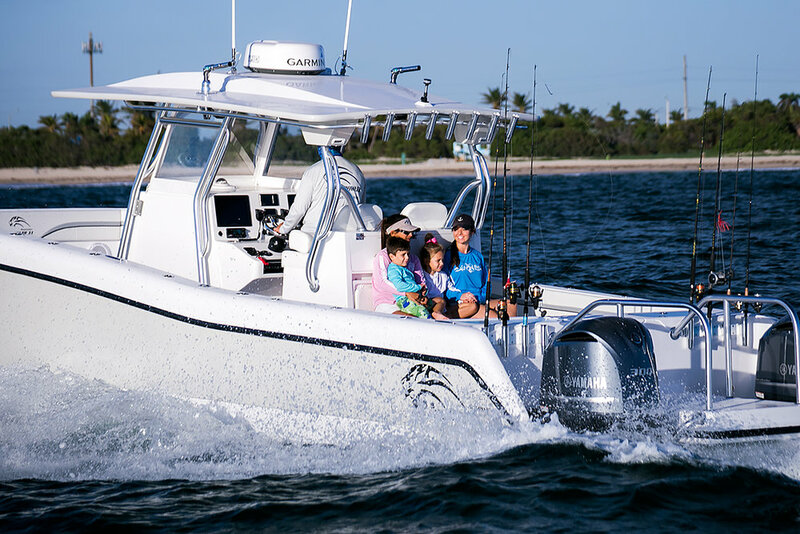 On the 31, a huge anchor locker holds ample rode for setting up on deep reefs and ledges, while an expansive electronics panel accommodates today's large multi-function displays. 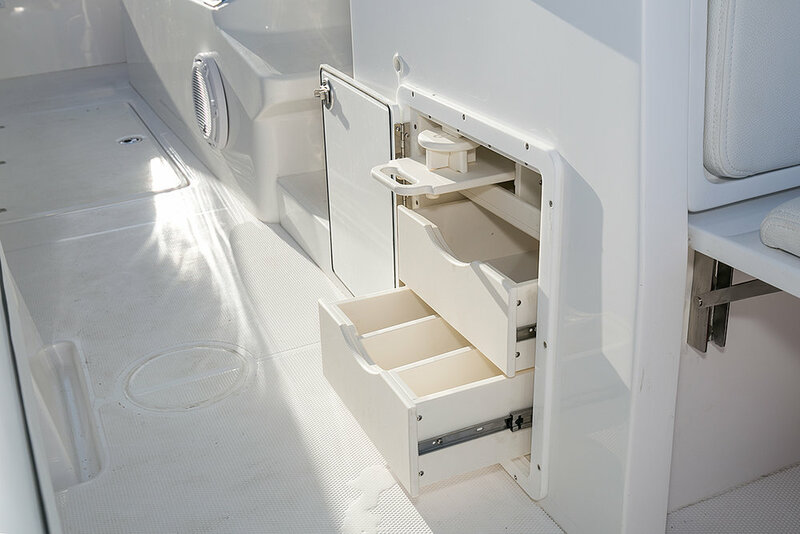 Ten rod holders in the console complement customizable rod storage on the T-top or hard top, leaning post, and transom, plus under-gunwale racks and lockable belowdecks storage. 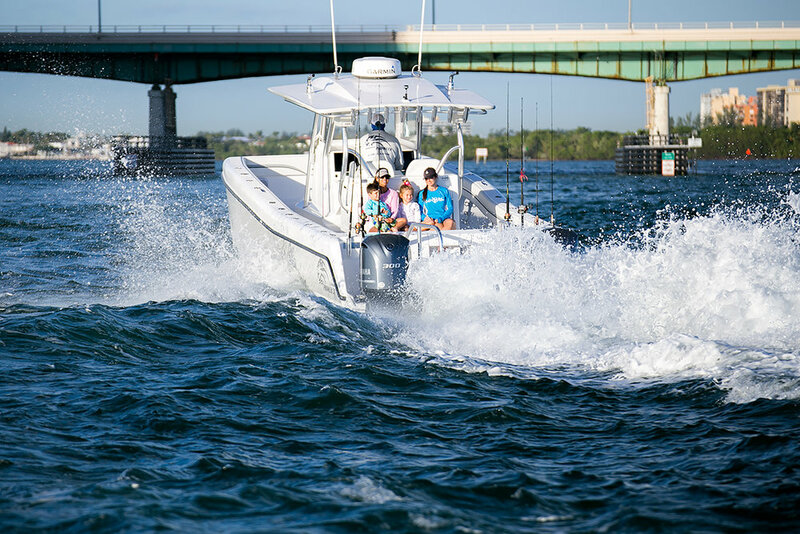 Eight top-grade gunwale rod holders are standard, but we'll help you configure the ideal setup for your style — from kite-fishing to deep-dropping to high-speed trolling. 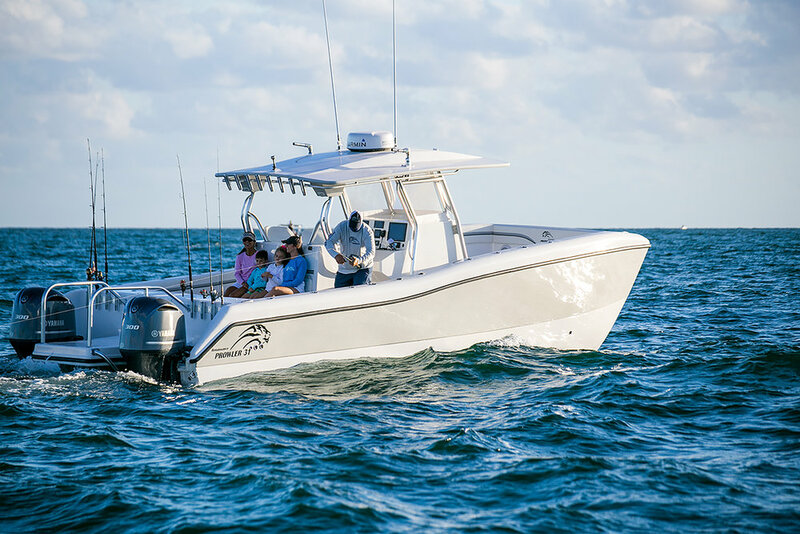 At over seven feet long, a massive, 383-quart bow fishbox can accommodate the biggest wahoo, while a pair of 489-quart belowdecks boxes with diaphragm pumps can each hold a day's worth of quality yellowfin.